The 12 months known in history as the Year of the Four Emperors was a pivotal chapter in the long epoch of the Roman Empire. It marked the tumultuous end of the Julio-Claudian Dynasty and the advent of a year of civil war, renewal and realignment, the result of which was the establishment of a new era and the founding of a new (and arguably more rational and responsible) imperial dynasty. The controversial year began with the decline of the Julio-Claudian dynasty under the rule of Emperor Nero. Nero was the last ruler of a dynasty founded by Julius Caesar, who was perhaps the most famous Roman emperor that never was. The Julio-Claudian succession included such names as Augustus, Tiberius, Caligula, Claudius, and of course Nero, names that resonate with great power throughout the chronicles of Roman history, in many cases thanks to the violence, madness, misrule and decadence that seemed to take root at the center of imperial Rome at the dawn of the common era. In 54 CE, at the age of 16, Nero ascended to the imperial throne, and for the most part his arrival was well received. Among his early achievements was the granting of certain basic rights to slaves, the strengthening of the senate, a reduction in taxes and the general encouragement of modesty and restraint. He was initially attentive to the military, the central pillar of imperial power, and indeed, it was during his reign that the British resistance was broken in the aftermath of the rebellion of the Iceni Queen Boadicea, which in 61 CE resulted in a signature Roman victory. However, with the passage of time, the darker side of Nero’s nature gradually began to manifest, and his cruelty and instability began to erode his early popularity. On July 18, 64 CE, Rome burned, with 3 of its 14 precincts destroyed and 7 others critically damaged. Although Nero responded to the disaster responsibly, by providing what assistance he could to those affected, rumors nonetheless circulated that he had been responsible for the fire, or at the very least had stood by and allowed it to consume those parts of Rome that he desired for the grandiose public works and building projects with which he was credited. In response to this, he blamed Christians for the fire, beginning the signature persecution of Roman Christians that has been so widely recorded in Roman history. Nero was eventually declared a public enemy, and finding himself without support, he committed suicide on June 9, 68 CE, the first Roman emperor to do so. Having left no heir, Nero’s death plunged the empire into confusion and chaos, bringing to an end the Julio-Claudian lineage while at the same time offering no clear rule of succession. This presented the opportunity for influential individuals in the empire, and in particular provincial governors who also commanded large military garrisons, to express and further their own ambitions to power. The result was a period of instability and civil war as several pretenders to the throne, among them the emperors Galba, Otho and Vitellius, gained and lost power, until finally the emperor Vespasian seized and retained the imperial principate. Vespasian imposed order and discipline on a chaotic empire and founded the Flavian Dynasty, which survived until CE 96, encompassing the reigns of Vespasian himself (69–79), and his two sons Titus (79–81) and Domitian (81–96). 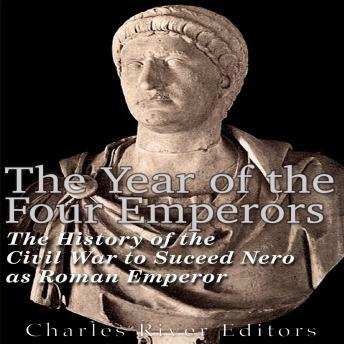 The Year of the Four Emperors: The History of the Civil War to Succeed Nero as Emperor of Rome chronicles one of the most important years in the history of the Roman Empire.